This workshop was beyond my expectation. Many ‘Aha moments’ helped me to understand myself better. I finally understand the power of the mind and the importance of being assertive. I highly recommend this workshop with Karin and Jana – they both planned and ran this workshop with the utmost professionalism. I really liked the connection with the horse, the explanation of the relationship of horses as our partners and the process of trying to convince the horse to move. That proved to be a good self-reflection which kept me busy thinking about my leadership skills and the need for improvement. This was the best eye-opening leadership experience I have had! Thank you Karin and Jana, I appreciate the effort and experience with which you lead the event. I have always found horses impressive; I was keen on participating in this workshop in order to establish a contact with such beings and work on my fear of horses. The set-up was very safe, to this end. On another note, the way the workshop was organized and facilitated by Jana and Karin helped raising very fast my awareness on some patterns and behaviours. I was then able to correct these and put into practice some alternatives on the spot…and it worked! I am looking forward to the next session! Thank you Karin and Jana! Sometimes is better to stop yourself and well think about the next steps than to try to solve it quickly but not so effective. If you want your colleagues to accept your solution, you have to be sure and convinced of your solution on hundred percent. I learned that it is important not to be afraid of task which seems to be difficult in the beginning. If something doesn´t work we must think about other ways to reach a goal. Business unusual might be the new usual. If we want to work together we must be sure that other party understands us well. Cooperation is about trust and communication. 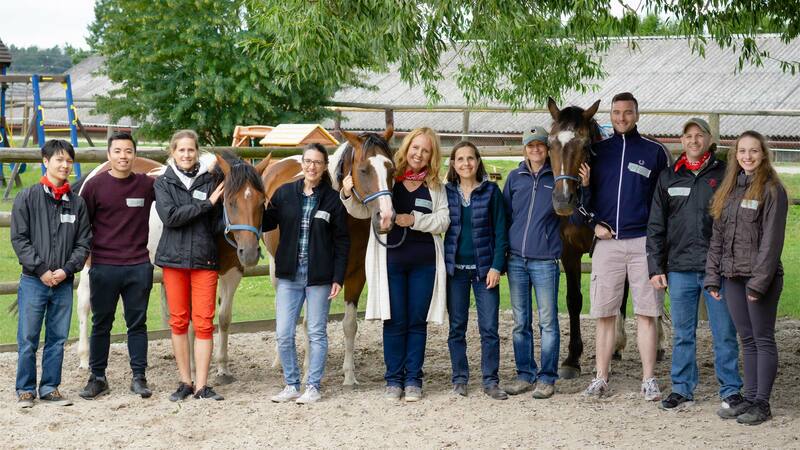 Thank you so much for organizing the CoachinWithHorses activity for my team. It was a truly unforgettable experience for all of us. All my managers spoke very highly about this unique learning opportunity. Everybody came back with long lasting memories and many take-aways and “food for thought” to our daily leadership roles. I can confirm we all realized how influential one's behavior can be and what impact it may have on others. We all agreed there was no better way how to project this than during the exercise with the horses. The achievements we had with our horses were not only surprising but most of all very educational and eye opening. The majority of my colleagues (including myself) have never been even close to a horse but we all left very proud of ourselves, including those who already had some experience with horses in the past. It was simply an amazing learning experience we will remember for the rest of our lives. Finally I must thank you for your professionalism in preparing our activity to every detail and most importantly for ensuring the highest possible level of safety throughout the entire exercise. Within our company safety of our associates comes first and therefore I am grateful for the level of attention you paid to making sure everybody was safe. I would definitely like to conduct another exercise later in the year or in the beginning of next and will recommend your “CoachingWithHorses” to my counterparts and business partners. Let me wish you all the very best with this unique coaching activity! I enjoyed the session with the horses. Mainly I had fun. I think your program provides participants with worthwhile insights. By interacting with horses, we learn who we are and how to make the most of our abilities. We also get a painless look at our weaknesses. One of the most unique development workshops I have ever participated in. The 2 hours were worth every second. I liked the interaction and proximity of horses in connection with a small group. Having the opportunity to discuss issues openly and honestly without any prejudice was contributing to already very relaxed atmosphere in the farm’s surrounding. Coaching with the horses is great and very easy way how to better understand yourself and your behavior. Personally, I enjoy the practice of use of our own energy and learn how to regulate it. Great unexpected experience of searching for the inner power by natural and instinctive way. I can only recommend this Coaching. We all have a great sense to understand each other beyond the verbal communication. This experience shows immediately how this works with each of us. Finally I have got over my fear of horses. This workshop was an interesting and unusual training with surprising benefit! This workshop with the horses was a good example that if you something want, you have to go for it. Horses has behavior similar like human. Cooperation, trust and communication in team is important. Coaching with Horses will be of great benefit to those who want to understand the importance of people management and leadership. Doesn’t matter which industry you practice, this session will help everyone! Things are not always as bad as it may looks for the first sight. Even if you are afraid at the beginning when doing something for the first time, it does not mean that you are not able to do it. So head up and try. Thank you so much for amazing experience during your and Jana’s coaching afternoon. I have never been around horses before and I did not know what to expect. But you made it easy, fun, joyful and when I did think about it backwards, I did learn a lot. From my side was very interesting exercise with not much, or too much pressure. Which when I did think about it backwards, this gave me a lot regarding managing my team and pushing them sometimes too much. Honestly, before attending Coaching with Horses I did not know what to expect, we did not get much information but I enjoyed it very much! Activity was well explained and was easy to follow. It was my first time with horses though. Thanks very much. Did not have any experience with horses before. Enjoyed 1st interaction with this intuitive animal. Helped to practice finding internal focus (in a present moment – here & now) on the objective set for myself or others, i.e. practicing focus and dedication. I really appreciate the feedback after every exercise – I saw the opinions of participants and also points of view from Karin and Jana very helpful in understanding of what was actually happening. The training gives a unique opportunity to appreciate what constitutes successful communication, how important it is to be consequential & persistent and that not all rules are always cast in stone & one must be able to slightly adapt the rules (judging its intensity carefully) to achieve results. You might be able to fool a friend or co-worker to believing that you have decided for something; but you cannot fool a horse. Horses can give you necessary self-insight to make a change in the way you communicate. Coaching with horse program is a unique opportunity to realize small important things which has a big influence on our daily life. Very useful experience for your daily attitude at working with people as well as working as a team member.